Your company finally got Google Analytics Ecommerce tracking up and running on the website. As the resident analytics pro, your job is to now take that data and turn it into insights that can help your company market better and be more profitable. 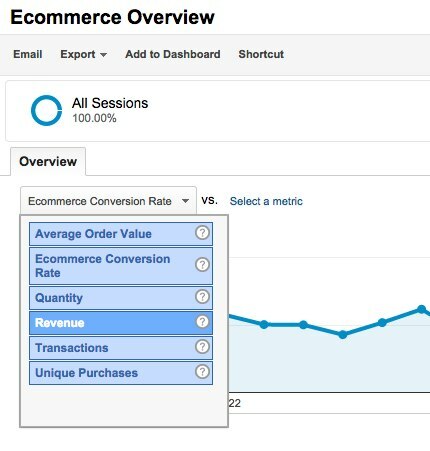 The Google Analytics standard Ecommerce reports provide an amazing amount of insight right out of the box. In this post, we take you through some of the key Ecommerce reports and indicate how the data they provide can help your company optimize your online selling. Ecommerce Conversion Rate: the percentage of Sessions (site visits) that result in purchases. In this example, we’ve configured the line chart to show Revenue. By default this chart shows Ecommerce Conversion Rate, but you can change that by clicking the dropdown in the upper left corner of the chart to select Revenue – or whichever metric interests you. Unique Purchases is a metric that often confuses people. It is different than Transactions in that it counts the types of items included in each checkout as separate purchases. For example, if a customer bought 12 apples, 6 bananas and 4 pears, Google Analytics would count that as 3 Unique Purchases and 1 Transaction. As described in this post, Unique Purchases is a useful metric for determining your customer’s buying patterns. Do they buy a lot of a particular product at once, or a little at a time on a frequent basis? In the example above, we see that there are 4,549 Unique Purchases and 2,334 Transactions. That works out to an average of 4,549 / 2,334 = 1.95; or about two unique product purchases per transaction. So what does that tell us? Since we see people are only buying two products at once in an average purchase, we could work on upselling additional relevant products when they are about to check out. For example, if someone is buying an apple peeler, rolling pin and pie crust to make a pie, why not try to sell them on a new pie pan as a suggested product before they complete a transaction? Once you have an overall picture of site performance, review the individual products by selecting the Product Performance report (Conversions > Ecommerce > Product Performance). This report breaks out statistics by individual product. In this example from a fitness industry website, we see the products sold over the past month, along with the revenue from each. By default, this table is sorted by the Quantity column, so you can see the biggest selling products on top. By clicking on the Product Revenue column, you can sort by revenue to see the top revenue-producing products on top. Use this report to quickly get up to speed on which products sell the most and which ones produce the most revenue. Popular low cost products represent upselling opportunities where you might want to place ads or promotions for more expensive items. Take advantage of these opportunities – small purchases from a lot of customers can add up to significant revenue! Beyond looking at revenue generated and products bought, look at how purchasers found your site. You’ll want to compare the sales contributions from various channels: social media, organic search, paid search, display advertising and email marketing. Look at which channels contributed to the most revenue, which ones had the highest ecommerce conversion rate and which ones had the highest order value. Remember, this analysis isn’t just to look at what’s happening now. It can help to drive future decisions as to where you should focus your online marketing efforts. To do this, select the Channels Report (Acquisition > Channels) and click on the Ecommerce tab in the Explorer above the chart. The table now shows ecommerce data broken down by channel. Leaving aside the “Other” category for a moment, we can see that Paid Search generated the highest amount of revenue and Referrals contributed the highest average order value. However, Affiliates shows a significantly higher conversion rate than the other channels that contribute significant revenue. This information tells us that users coming from our affiliate sites are much more likely to convert into purchasers. What about the “Other” category at the top of this report? This includes all the sources of traffic that Google Analytics does not know how to group into a channel. Clicking on “Other” drills down into the channel to show the sources that contributed traffic in that category. Here, you can see that these sources are marketing partners, like Listrak, that have been tagging marketing campaigns in ways that do not fit into Google Analytics’ default channels. The Channels Report attributes revenue to a channel based on the last click. For example, suppose a customer first found your website from an email campaign, and they browsed around but didn’t buy anything. Later, they clicked on an AdWords ad, visited your site, and made a purchase. This transaction, and its revenue, would be attributed to Paid Search in the Channels Report. This kind of attribution is referred to as “last click” because the channel providing the last click before purchase gets all the credit. Sometimes, however, you want to know not only which channels are providing the last click, but also which channels are assisting with the ultimate generation of revenue. You need this information to understand the effectiveness of each of your marketing tactics. To get this perspective on your ecommerce strategy, you can use the Multi-Channel Funnel reports. Open the Assisted Conversions Report (Conversions > Multi-Channel Funnels > Assisted Conversions) and you will see something like this. The first two columns in this report, Assisted Conversions and Assisted Conversion Value, show the transactions and revenue associated with the channels that visitors used to reach the site before the visit on which they actually made a purchase. The next two columns, Last Click or Direct Conversions and Last Click or Direct Conversion Value, show the transactions and revenue from that channel providing the last click resulting in the purchase. In this example, you can see 1,360 Paid Search visits assisted in generating $50,898.71 in revenue, whereas 2,212 Paid Search visits resulted in purchases of $83,782.03. The final column is a ratio of Assisted / Last Click. This metric provides a sense for whether the channel plays a greater role assisting in purchase or generating purchases. A number greater than 1.0 indicates that the channel provides more assists than purchases. As is typical, in this case the Display advertising channel generates more assists than purchases, and its ratio is 2.75. In addition to looking at what sources contributed to revenue, we want to look at what geographic regions transactions came from. 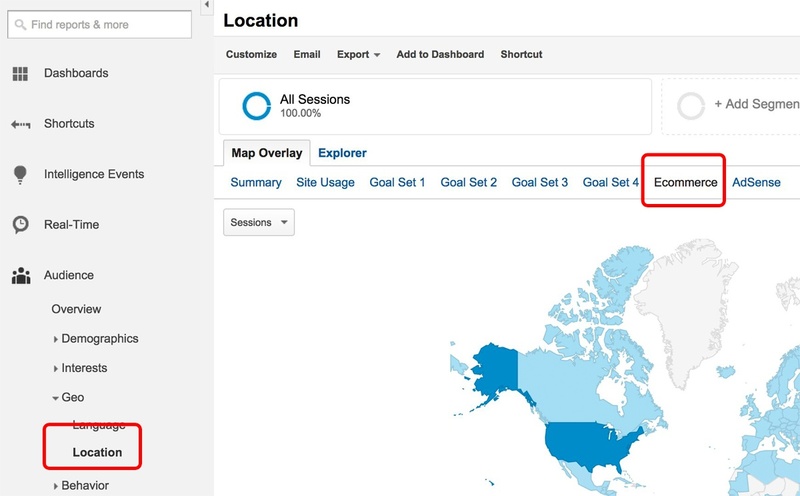 The Location Report (Audience > Geo > Location) can provide a breakdown of ecommerce stats by geography if you select the Ecommerce menu item from the Map Overlay tab. Now, under Primary Dimension, we can click on City, and then click on the Revenue column to product a table sorted by the highest revenue producing cities. Using this report, you can compare how different geographic markets performed in meeting target revenue goals, as well as identify profitable regions where you should focus more on targeting. For example, for this site, we see that New York and Los Angeles have contributed the most revenue, but that San Jose has a much higher Average Order Value. This suggests that a targeted email campaign to Silicon Valley might be a particularly profitable undertaking for this company. Are you selling where you’re most likely to be effective? 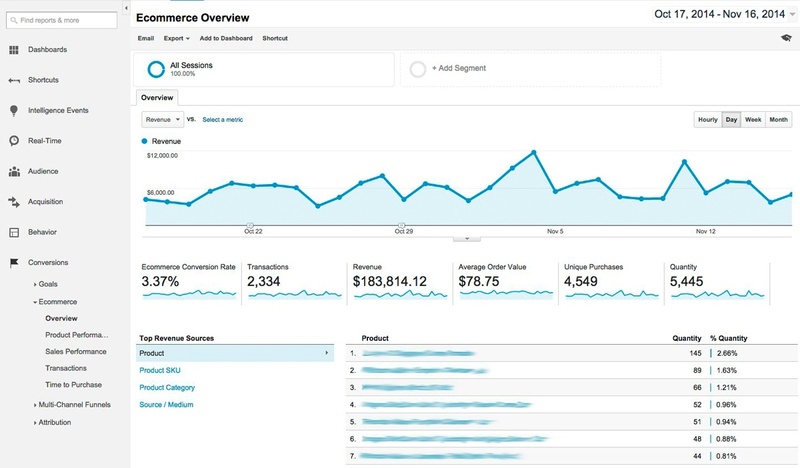 The standard Google Analytics Ecommerce Reports offer a wealth of data and are a great starting point for analyzing the performance of your online store. You can use these reports to identify the highest revenue generating products, find opportunities to upsell additional items and compare the effectiveness of various marketing channels. In addition, you can identify your best performing geographic regions and identify areas where there is opportunity for more revenue.